Tactical Faith is proud to bring Eleonore Stump to Birmingham, Al. November of 2017 Professor Stump will be doing a three day tour with Tactical Faith to UAB and St. Paul’s Catholic Church. She is the Robert J. Henle Professor of Philosophy at Saint Louis University. 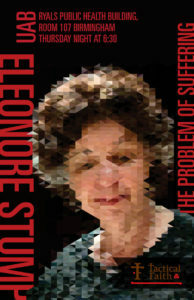 She has taught since 1992 and has studied medieval logic, Thomas Aquinas, and the hard topic of Suffering. We are looking forward to having such a deep Christian thinker on our side, and in Alabama. This is a landmark event and partnership for Tactical Faith. It marks not only our first Catholic Speaker, but also our first partnership with a Catholic Diocese. We are a “Mere” Christian organization and as such we are prayerfully looking forward to this event.